No film has generated more buzz at this year's Sundance Film Festival than Whiplash (review here), which was one of the first movies picked up when Sony bought the rights. 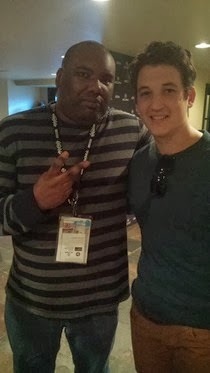 That's also put star Miles Teller back in the Park City spotlight just a year after his festival darling The Spectacular Now premiered here, and with all sorts of studio reps flocking around it's meant that at least one major deal has come his way with another possibly on the horizon. I had a chance to speak with Teller about Whiplash, and will be posting that interview shortly. But being who I am, of course I had to ask him about Fantastic Four, which he confirmed some time ago he was up for playing Reed Richards. I asked him point blank if we will see him in the film as Mr. Fantastic, and he didn't exactly shoot me down, saying "Yeah, that should be coming up in the next few weeks". Without getting into other specifics, he definitely seemed interested and excited for the film, which we know will be directed by Josh Trank and hit theaters March 6th 2015. THR has learned that Teller has also been offered the role of Dan Akroyd in the James Belushi biopic being put together by writer/director Steve Conrad. Emile Hirsch, who landed the coveted Belushi role some weeks ago, revealed the news himself right here at Sundance, although Teller's reps are saying nothing is set in stone just yet. Teller won't be committing to anything until after he finishes up press on the comedy That Awkward Moment, which co-stars Michael B. Jordan, who just so happens to be rumored for Fantastic Four, as well. Wonder if the two have spoken about it?